Bombfell is another entry into the men’s monthly subscription clothing box space. There are some differences between Bombfell and other such services, like Fashion Stork, Trendy Butler, or Trunk Club, in that there are some upfront customization opportunities. Finally, they state that you have 10 days to try everything out, return what you don’t want, and pay for what you keep. It is also worth mentioning that you can set the frequency with which Bombfell sends clothing (monthly, every two months, every three months). I’ve been interested in a casual blazer to wear about town, so I requested a blazer and button down shirt. My clothing arrived packaged neatly in separate bags, and the blazer came equipped with a hanger. However, also heavy duty is the price (around $130). Original Penguin makes great stuff, but the cost can be prohibitive for many folks…like me. The light salmon sweatshirt by Sons of Fortune was also a nice piece of clothing. Well-constructed, nothing cheap about it. Nothing. Including the $80-to-keep-it price tag. One common issue is sizing. By the nature of online shopping, sizing issues will always abound. Small in one brand is medium in another. Tradition cut or slim fit? And what about athletic cut? It’s all very difficult for an online stylist and customer to hash out when they are not face-to-face. 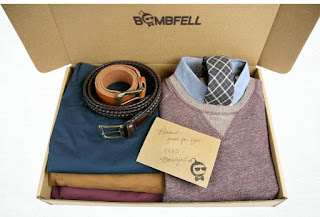 While Bombfell offers free return shipping (which is common in men’s subscription boxes), I found a lot of horror stories about items that were returned because the customer didn’t like the style, only to get it back in a different color. Is that really cool? Or really creepy? I’m just not sure… However, truth be told, I do appreciate the fact that they are trying to nail down my style as accurately as possible. All in all, I believe Bombfell provides quality, stylish clothing, but the lack of shoes and high prices, as well as some question marks in reissuing of items and social media stalking, requires me to give Bombfell the thumbs down. I know, I know…. some people like that kind of stuff, but not me. That said, if you don’t mind the full price eCommerce model, Bombfell may be worth a try. They can be found at www.bombfell.com - I’m curious as to what my readers think, so feel free to share your experience.